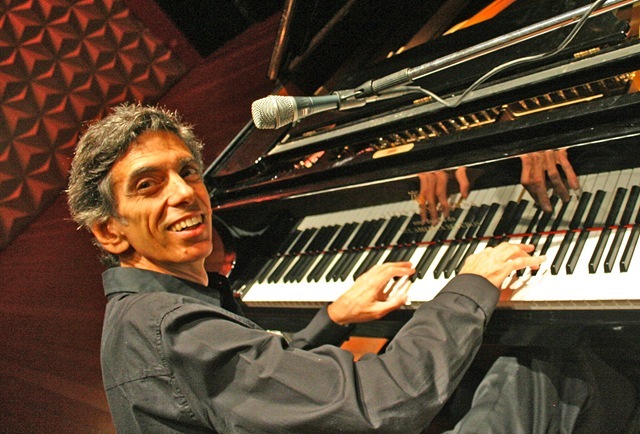 MONTICELLO, NY (July 25, 2015) – World renowned composer, singer and pianist Luiz Simas will instruct and entertain at the Eugene D. Nesin Theatre for the Performing Arts, at 22 St. John St. in Monticello, on Tuesday, August 11. The hands-on workshop and lecture performance runs from 4 to 5:30 p.m.
Simas was born in Rio de Janeiro and has lived in New York City since 1989. Simas (a music teacher and arranger) has released 6 CDs in the US, and has performed on over 300 recordings worldwide. Tickets are $15 and, as always, students with an ID are free. This project is made possible in part with funding from a Sullivan County Arts & Heritage Grant funded by the Sullivan County Legislature and administered by the Delaware Valley Arts Alliance. During this introduction to Brazilian rhythms and music styles, Simas will demonstrate on the piano the differences between the two main families of rhythms in Brazil: the "samba" family (choro, traditional samba, bossa-nova, etc.) and the "baião" family (baião, afoxé, xaxado, etc). Simas will then illustrate those differences by teaching how to play those rhythms using hand percussion. The students will play two different pieces together on their instruments: a simple samba, and a simple baião. Music sheets will be provided for the different instruments. Miscellaneous percussion instruments will also be provided to those who didn’t bring their own instruments. Simas will then play and sing pieces which illustrate what was taught in the workshop. The students may be asked to join Luiz in one last number if they wish. For more information, contact Ellen Nesin at: (845) 794-6013 or e-mail: ellen@nesinculturalarts.org.